While popular history tends to bring forth the notion of Alexander the Great as a military genius (and rightly so), his generalship was not only mirrored by his individual brilliance but also the impressive efforts of his army. To that end, in many ways, the destiny and legacy of Alexander were rather forged by the military prowess, organizational capacity, and revolutionary battle tactics of his commanded Macedonians. Pertaining to the latter, YouTuber Historia Civilis has concocted a nifty animation that aptly presents the famed ‘hammer-and-anvil’ tactic of the Macedonian army during Alexander’s time. Now while the animation does a great job of focusing on the battle side of affairs, we have decided to talk more these individual unit types in the ancient Macedonian arm, like the Companions, Foot Companions, and the Shield Bearers. The following paragraphs are excerpts are taken from two of our previous articles – 10 Things You Should Know About The Ancient Macedonian Army and 5 Facts About The Macedonian Phalanx. Macedonian phalanx. Illustration by Johnny Shumate. The Macedonians had one significant advantage over other southern Greek city-states, and that ironically related to ‘simple living’. In other words, the Greek hoplite was essentially a farmer who was tied to his land, and such made up the bulk of the middle class of his society’s economy. This resulted in more stringent campaigning seasons since the hoplites couldn’t be too far away from their agricultural lands. However, as for the developing state of Macedon, most of its male population took part in simpler economic activities, like herding animals (based on seasons). So, during times of war, when such conscripted men campaigned far and wide, their economics tasks could also be alternatively handled by older men, women and even (in certain cases) children. Macedonians, my speech will not be aimed at stopping your urge to return home; as far as I am concerned you may go where you like. But I want you to realize on departing what I have done for you, and what you have done for me. Let me begin, as is right, with my father Philip. He found you wandering about without resources, many of you clothed in sheepskins and pasturing small flocks in the mountains, defending them with difficulty against the Illyrians, Triballians, and neighboring Thracians. He gave you cloaks to wear instead of sheepskins, brought you down from the mountains to the plains, and made you a match in war for the neighboring barbarians, owing your safety to your own bravery and no longer to reliance on your mountain strongholds. He made you city dwellers and civilized you with good laws and customs. Those barbarians who used to harass you and plunder your property, he made you their leaders instead of their slaves and subjects. The Hetairoi or Companion cavalry was in many ways a military extension of the political framework of ancient Macedon centered around the king himself. Most members of this elite cavalry regiment were recruited from the nobles (and their sons), and they possibly numbered around 1,800 men, divided into 8 squadrons (ilai), before the start of Alexander’s momentous expedition into Asia. Among these units, the Royal Squadron (Basilike Ile) with its double numbers held the position of honor in battles, and such its members were usually drawn from the Personal Companions and Friends (philoi) of the Basileus. 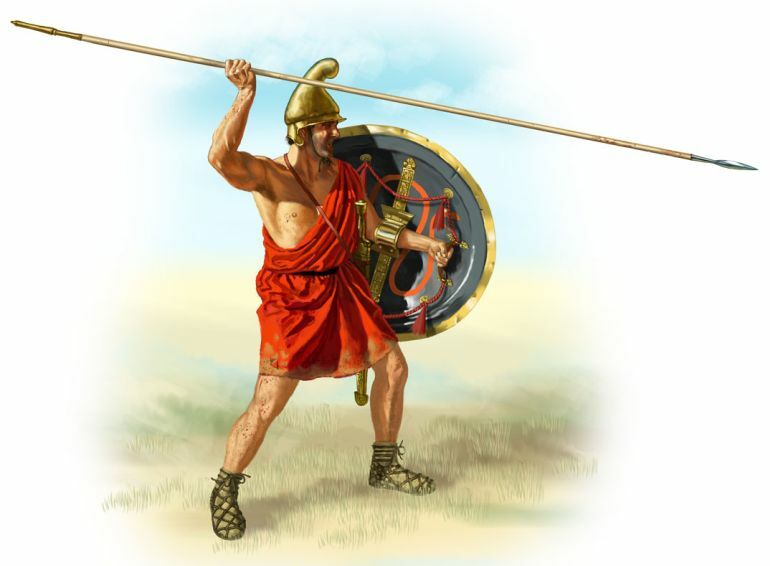 Befitting the elite ‘hammer’ of the Macedonian army, the Hetairoi flaunted their uniforms, with the Royal Squadron members ostentatiously displaying purple cloaks or chlamys (dyed with Tyrian purple) with golden yellow borders – many of which were confiscated from the Persian treasury. 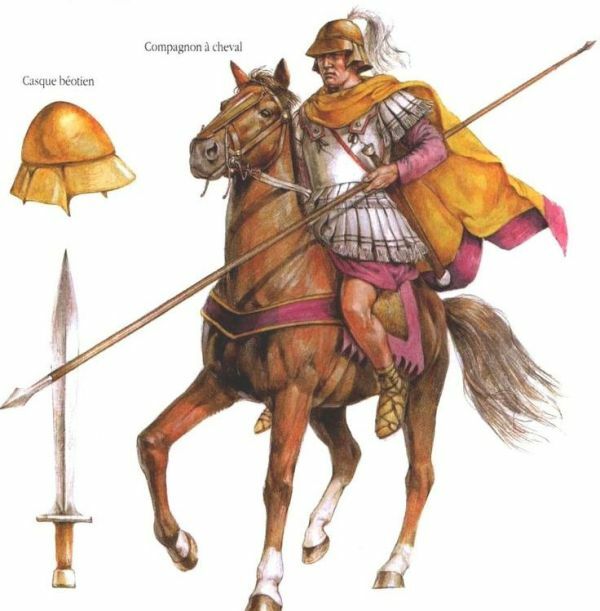 They were also presented with standard yet flexible cuirasses, possibly made of small metal pieces that were reinforced with leather or covered in white linen, along with the Boeotian helmets that replaced the earlier Phyrgian models. On the offensive avenue, the Companion cavalrymen were equipped with the lengthy xyston spears usually made of sturdy cornel wood, and these were backed up by the secondary weapons of swords. Interestingly enough, there may have been a conspicuous absence of shields – the mainstay of Greek warfare, when it came to cavalry maneuvering, except on rare occasions. And since we brought up the scope of defensive equipment, it is widely known that Alexander himself preferred to ditch his cuirass in favor of just his tunic, probably to enact bouts of bravado during the earlier parts of the expedition (or possibly due to the heat). Suffice it to say, fueled by the personality cult of Alexander the Great, many of the impressionable noble youths from the cavalry regiments may have also tried to mimic their leader and charged into the battle – wearing just their ritzy tunics and armed with the xysta. 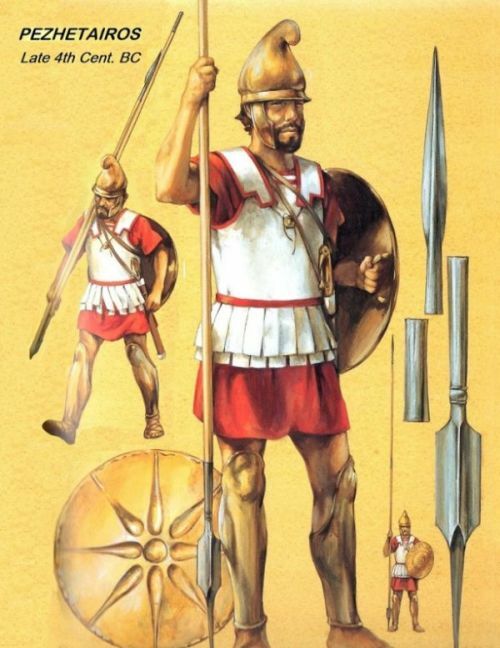 Before the Macedonian army crossed the Hellespont, the mainstay of their infantry comprised the Pezhetairoi (or Foot Companions) – men who the formed up the dreaded ‘anvil’ of the phalanx. Numbering around 9,000, these infantrymen were divided into six battalions (taxeis) – each comprising three lochoi. And mirroring the honored units of their cavalry counterparts, the Pezhetairoi possibly had an elite taxis of their own known as the Asthetairoi, with its members (preferably) recruited from Upper Macedonia. Now in terms of equipment, ancient writers and pictorial evidence rather paint a vague picture of the renowned Macedonian phalangites. 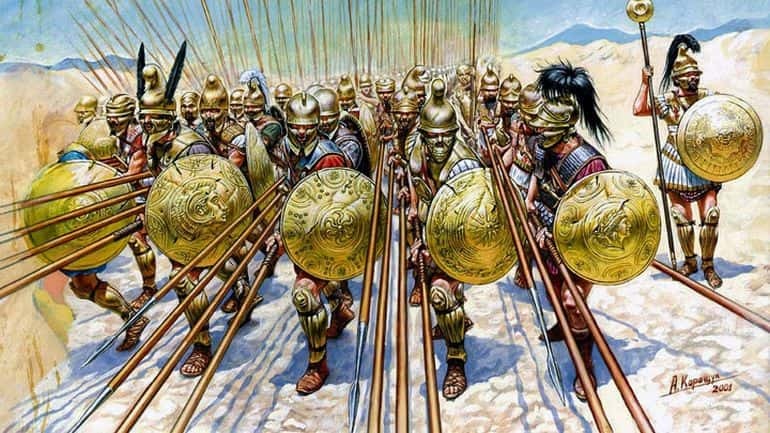 According to Polyaenus’ account of Macedonian military training, the infantrymen of phalanx were supplied with bronze helmets (kranos) of the Phrygian variety, light shields (pelte), greaves (knemides) and their characteristic long pikes (sarissai). So as can be gathered from this small list of items, the armor is conspicuously missing. On the other hand, Diodorus talked about standardized forms of armor being issued during the tough Indian campaign, thus suggesting how at least some of the Pezhetairoi wore cuirasses. Interestingly enough, one of the accounts of Polyaenus anecdotally entails how Alexander himself armed the men who had previously fled the battlefield with a hemithorakion – a half armor that only covered the front part of the body so that the soldiers wouldn’t turn their backs on the enemy. 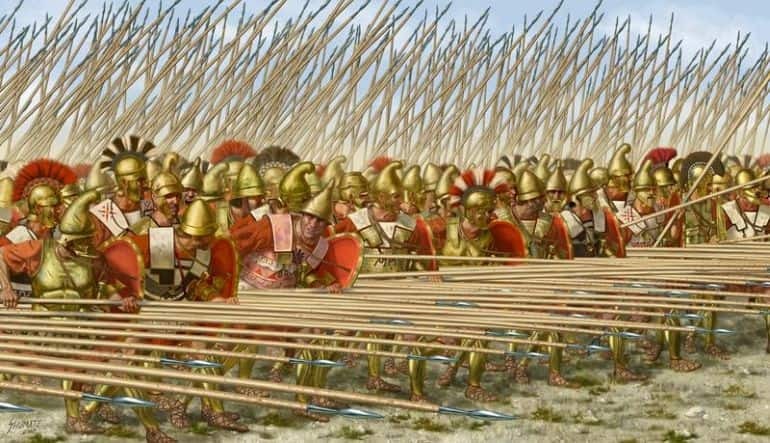 But as mentioned in the video, beyond the scope of their armor, it was the bristling set of pointed sarissai that presented a nigh-impenetrable (albeit rigid) formation of the Macedonian phalangites. The longest of these sarissa pikes reached 18 ft during the times of the Wars of the Successors after Alexander’s death. Considering the defensive attitude of his successors, it can be assumed that in Alexander’s lifetime the sarissai were possibly somewhat shorter. These lengthy spears were also known for their distinctive small iron heads that were more conducive to breaching the armor of the enemy. The Shield Bearer. Illustration by Johnny Shumate. Many historians have theorized that the Hypaspistes (‘Shield Bearers’) had their origins as retainers of the Companions of the royal court (not to be confused with the Hetairoi Cavalry), while others have hypothesized that they evolved from the mainline Pezhetairoi infantry. In any case, they probably bore a higher rank than the members of the Macedonian phalanx, and such also comprised an agema (vanguard) known as the Royal Shield Bearers (Basilikoi Hypaspistes). This unit, made up of taller candidates, expressly took the position of honor on the battlefield on the right side, supported on the left by other lochoi of Hypaspistes – and together they possibly had a strength of around 3,000 men. Now considering the relatively rigid tactics of the aforementioned Pezhetairoi, it can be surmised that the Hypaspistes probably fulfilled a flexible battlefield role that bridged the gap between the mobile cavalry and the ‘stagnant’ phalanx. Judging by this requirement for agility, it can be assumed that the Hypaspist wore less armor when compared to his infantry comrades of the Macedonian army. To that end, Alexander may have equipped many of his Hypaspistes in a manner similar to that of Greek hoplites, thus suggesting the usage of Phyrgian helmets, lighter tunics, and shorter spears. At the same time, these Shield Bearers formed the crack units of the army, and they proved their worth in many a siege battle, by taking part in the frontal assaults conducted within cramped quarters. In essence, it is fair to assume that the Hypaspistes were better trained and drilled than most contemporary infantry units, while their (required) agility kept them at the peak of their physical conditions. Given their esteemed martial value, many of the veteran Hypaspistes possibly also formed the renowned Argyraspides – the ‘Silver Shields’ who later took part in the Wars of the Successors after Alexander’s death.